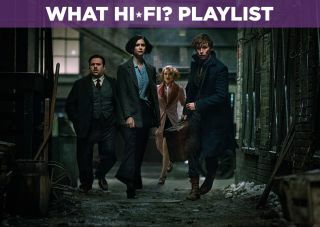 Fantastic Beasts and Where to Find Them - Blu-ray review | What Hi-Fi? The world of Harry Potter returns in spin-off Fantastic Beasts but is the magic still there? Harry Potter is back. Well, sort of. Six years after the end of Harry Potter’s adventures (unless you discount last year’s stage play) comes a spinoff in the shape of Fantastic Beasts and Where to Find Them, which takes place several decades before the events of the Philospher’s Stone. At a time when Hollywood prequels, reboots and spin-offs of existing franchises has became very fashionable, it seems obvious the Harry Potter world would come back in some form. But is Beasts a fitting return or a misfire for the beloved franchise? Directed by Potter veteran David Yates from a script by J.K. Rowling (her first), it follows Eddie Redmayne’s Newt Scamander, a magizoologist who arrives in New York with a suitcase full of magical creatures that escape when he accidentally swaps cases with Dan Fogler’s Jacob Kowalski. Katherine Waterston’s Tina Goldstein, an agent for MACUSA (Magical Congress of the United States of America), spots Newt using magic and arrests him. But once it emerges the case full of creatures is missing they have to find Jacob and retrieve the animals. These various plots and subplots make for a stuffed film, and flow is affected as a result. Given the title, you’d be forgiven for imagining Beasts is an adventure about finding magical beasts, but it incorporates darker subject matter (including child abuse) and tonally it makes for an uneven film. The story is not helped by how similar some of it is to Philosopher’s Stone either - it feels less fresh than it ought. A bit of darkness and danger is welcome, but here it feels like two slightly different films are taking place. It misses more of the lighter tone that graced the earlier Harry Potter films and is stuck with the task of building the foundation for future Beast films, of which four more are slated. Right now that seems excessive. We ought to mention the fantastic beasts of the title, the various animals that have gone rogue in New York and they are a charming bunch with just that little tweak that makes them magical. Special mention should go to the Niffler, a sort of Platypus duck with an eye for stealing jewelery and features in some of the film's funnier moments. Nevertheless it’s an enjoyable film. Eddie Redmayne puts in another typically committed performance as Newt Scamander, who is fonder of his animals than he is people. He plays Newt like a magical, anti-social David Attenborough, with a love of ecological conservation that clearly speaks to the Rowling’s own interests. Katherine Waterston as Tina Goldstein gets (one of) the film’s emotional arcs as a former Auror who’s looking to make amends, and who's just as awkward as Newt. Fans will know where her relationship with Newt eventually goes (and no doubt will be explored in the forthcoming films). Dan Fogler’s Kowalski is the film’s comic relief (and a fine job he does too), while Colin Farrell’s MACUSA Auror Percival Graves has a rather sinister presence - you sense he’s hiding something from the very moment you see him on screen. From an A/V standpoint Beasts is a fantastic showcase. While visually it’s not the most striking, owing to a colour tone that’s tuned towards golds, browns, greys and lilac with a few pinks standing out, it’s a clean-looking film that evokes the setting’s Depression-era aesthetic. The Blu-ray emphasises the strong production design, bringing out some wonderful art-deco architecture. Blacks are strong, and there’s a excellent sense of detail - the textures of clothes is always noticeable - even if the visual effects aren’t always integrated well (the overall quality of the CG animals can be a little inconsistent). Skin-tones look natural enough but are slightly muted, perhaps owing to the film’s overall look. It’s in the sound department that Fantastic Beasts goes up a notch, with dialogue that’s clear, legible and prioritised to the centre channel. It’s not a particularly bombastic track but a smooth-sounding one that uses all the channels, both front and back, to produce an immersive experience. Effects pan across the surrounds and are intricately detailed: listen to the bricks rebuilding in Jacob’s bedroom. In a scene early on at the MACUSA work permit office, you’re treated to sounds that whizz from the front and behind, and it really adds to this world that’s full of magic just happening outside the frame. Last but not least is James Newton Howard’s jazz-infused score that lends a lightness to proceedings and scores the action well with a few new themes, although none quite match John William’s iconic Hedwig’s Theme. Fantastic Beasts and Where to Find Them is a strange one. It’s not quite the film you’d expect if you just read the title, with a tone that can jump from light to dark in ways that don’t always mesh well. The performances are all watchable as the actors comfortably inhabit a world that’s been around 16 years. It just doesn’t quite make as much of an impact as you’d like, and that’s down to the aforementioned tonal issues and, at times, how predictable the story is. It’s also charged with doing the heavy lifting for the series, re-establishing a world and adding new characters.